The rambling rose Newport Fairy two stories up a tree and in full bloom. Most of you have likely read in a book or heard someone talk about growing roses into trees. You may have seen photos of rambling roses spilling out of trees in a canopy of blooms. But exactly how do you do it and will in work in an average sized garden? Let’s start with the first part. A rambling rose is so named because they literally ramble to a great size – eventually putting out twenty-five to thirty foot plus canes. Left on their own they will grow into a mass thicket you could probably hide a small car in. They are also spring flowering, which means they put on quite a show for about 4-5 weeks. 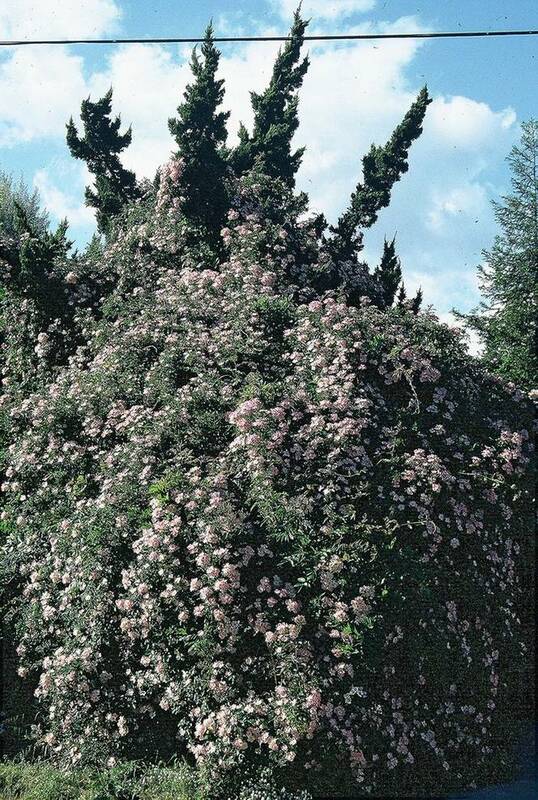 Growing rambling roses into trees makes perfect sense because it’s a way to take advantage of the great size they can reach without them spreading out and taking over your garden. They also tend to bloom before the tree fully leafs out, giving you a great spring show and tree takes over for the rest of the season. Start by selecting a tree that is nice sized but not a monster. Also one that has a more open canopy is good so dappled sunlight can get down to the rose. I’m not an arborist so I won’t make suggestions but perhaps some of you may have some. Additionally trees that don’t have shallow fibrous roots are better so the rose won’t have to heavily compete. When it comes to digging a hole in this case I’m going to advice going larger and up to two feet by two feet is a good idea. Plant the rose on the south east side of the tree so it can take advantage of the morning sun as it matures. I’ve seen recommendations to plant outside the drip line of the tree, but on a good sized tree that can be far away! I’d recommend five feet or so away from the trunk. Plant the rose at a slight angle pointing towards the tree. Put a long pole in the ground from the base of the rose to the tree and as the rose starts to grow train the canes along the pole towards the trunk. Once the canes get into the tree just point them up into the branches and they’ll know what to do from there. Roses seek the light, which means those canes are going to naturally head up the tree and outside the canopy to find sunlight. The beauty of a mature rambling rose in full bloom is an amazing sight. One that many gardeners don’t think they fit into their garden. Yet, by taking advantage of a rambling rose’s desire to grow up and seek the light you can fit one of these beauties in most any sized garden. So the answer to the second part of the questions is yes; you can grow a rambler in an average sized garden. The only other thing to do is warn your tree surgeon when they come to prune the tree!